Would You Pay to Sit? A paid public seating experiment in Bat Yam, Israel by Vincent Wittenberg. Photo by Vincent Wittenberg via Web Urbanist. 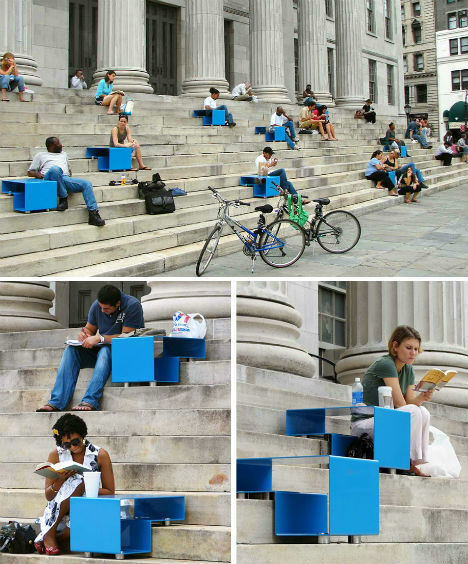 One of the reasons a public spaces becomes successful (meaning well-used) is because it is customizable and an important part of being able to customize your space is being able to have many different seating options. Individual, light-weight chairs which are not bolted into the ground, allow you to customize your experience by siting alone, siting in groups, moving in to the shade or moving in to the sun. Some municipalities and businesses are weary of incorporating these types of chairs in our public spaces because they are understandably afraid these chairs will be stolen. It’s not easy to be secretive about stealing brightly colored chairs in the bustling pedestrian plazas of Manhattan, but for lesser populated areas, stealing street furniture (chairs, tables, umbrellas, trash cans, etc) can be an issue. Mr. Wittenberg proposed that Bat Yam install benches which could also be converted in to individual seats. These seats will only be released once a five Shekel coin has been deposited but once the seat is returned, so is the coin. Artist Fabian Brunsing tackled similar themes with a piece which criticizes the privatization of our public spaces. His “Pay & Sit” bench installation allows users to pay to sit comfortably on an otherwise spiked bench – but only for a short period of time. Thankfully, a loud warning signal alerts you to the need to get up quickly, before the metal spikes return. 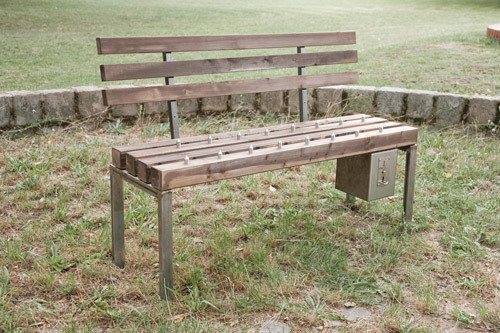 “Pay & Sit” bench by Fabian Brunsing. Photo by Fabian Brunsing. Street furniture being stolen is an important issue but should this issue (and others concerns such as street furniture encouraging negative activity, graffiti, homeless individuals sleeping, etc) deter us from providing furniture at all? 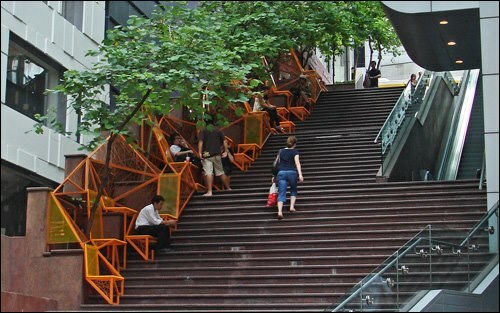 Successful public spaces are also those that are comfortable to a diverse audience (with a wide spectrum of physical abilities, those carrying heavy loads, those with children or elderly companions, etc) and therefore they are important to public spaces. These artists explore and exploit our desire for more successful public spaces.